The Realtree AP Snow Lens Cover for the Nikon 300mm f/2.8 VR/VR II Lens from LensCoat is a 100% closed-cell neoprene coat that protects the lens from bumps and scratches. It is useful for nature and outdoor photographers, as well as sports shooters and photojournalists. It provides a thermal barrier, protecting your hands from cold lens surfaces in lower temperatures. The cover is waterproof, providing protection to your lens in wet conditions. The LensCoat Lens Cover is easy to install and remove, leaving no residue on the lens. This cover can help you preserve the resale value of the lens by protecting it from dust, dirt and other contaminants. 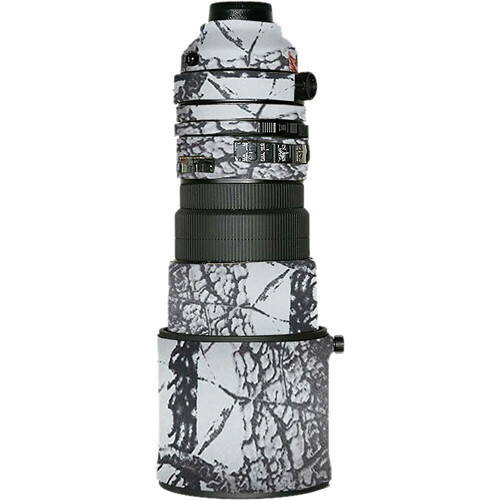 This version is white and features a subtle pattern of leaves and branches to help camouflage the lens when you are shooting in snowy conditions. Box Dimensions (LxWxH) 7.9 x 7.0 x 0.9"
Lens Cover for the Nikon 300mm f/2.8 VR / VR II Lens (Realtree AP Snow) is rated 4.4 out of 5 by 27. Rated 5 out of 5 by James from Great Product I use the LensCoat systems on all my lenses for wildlife photography for basic all around protection. I am hard on gear pulling it in and out of backpacks and lugging it around through marshes and all kinds of brushy dirty environments. These have become a necessity. If I decide to sell a lens you can remove these and the lens looks like new which helps retain resale value. Rated 5 out of 5 by PA Birder from Looks like a tree Does a pretty good job of protecting the lens from scrapes and scratches when walking through the woods and fields and gives me enough camo when I'm set-up in a blind with the lens sticking out while taking bird pics. Found it a little difficult to install initially but after the first coouple of pieces I found that if you turn the pieces inside out they will slide into place a little easier then you have to roll it outside in when you get it about in place. Rated 1 out of 5 by jane of maine from Don't waste your money This product was so difficult to install that it required two people. When installing the first of six pieces, the small hole in the neoprene which needs to slip over the knob on the lens hood tore in spite of the care taken to apply it. When finished installing you have six strips of neoprene stretched over most of the lens. It might protect the finish, but I'm not convinced it will do much else. It seems extremely overpriced for what it actually does. Since I've opened it and installed it, I cannot return it. I am disappointed in this purchase. Rated 4 out of 5 by Anonymous from Good protection/camo for wildlife photos Good protection for an expensive lens in field conditions - it prevents scratchs from grasses and bushes, and in minor extend camo your equipment. However, as the 300mm f/2.8 lens is commonly used with teleconverters (Tc14EII, TC17EII, TC20EIII, why not to provide an additional camo piece for converters? Rated 4 out of 5 by KirkfromChicago from Way over-priced but useful This product consists of a series of custom-fit, thin neoprene rubber bands that slide over sections of the lens. The bands provide good camouflage and a slight amount of protection against bumps, and keep the black lens from over-heating during the summer and from feeling cold to the touch during the winter. As for weather sealing, one of the bands covers the row of switches with a see-through plastic window, but other than that I wouldn't count on the Lenscoat to deliver extra protection in the event of rain or snow. The carrying case for this lens is a tight fit and after just a few days of sliding the lens in and out the band covering the hood is already showing some wear due to abrasion. May have to wrap some camo tape around the end to ensure that the band doesn't fall apart. Rated 5 out of 5 by Karl C. from Again,another nice cover I had previously bought this camo cover for my other lens last year and it has worked out well so I bought another one for my new lens. Fits well. If you buy the cover, but the next size smaller, large if you are not using the lens hood. Rated 5 out of 5 by Bob from Nice Product-Good Tight Fit Purchased to protect from bumps and scratches and to protect my hands from the cold. I should have purchased earler. Just an FYI, the image shown is for the wrong lens. Rated 3 out of 5 by Marcel Huijser from good protection and thermal barrier I think the lenscoat protects expensive equipment from minor impacts and scrapes well. It also allows for a thermal barrier in cold weather when handling the lens. I am less concerned about a potential camouflage function though. The pieces fit the lens well, except for the piece on the focus ring; it appears a bit too wide, causing some friction. I would recommend leaving the piece for the focus ring off or using scissors to make it a bit more narrow to avoid the friction.